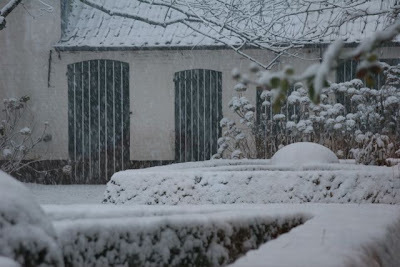 So what shall we conjure in our little kitchen to celebrate the icy temperatures? What shall we make to forget the long traffic jams? Unbelievable how a few drops of snow can mess up a whole country. Friday February 3, 1145K cars moving slower than the laziest turtle on earth! In a country that’s only 350K long! I’ll bring you a Mexican dish, something dark and intense with exotic flavours. It will fill your body with warmth and you’ll want to go dancing in the snow. Because, although snow is a nightmare “traffic-wise”, it’s absolutely mystic. Once your mole is simmering away on the stove, step outside in the magic. Enough philosophy now back to the kitchen! Mexico is where it all begun, where my “food-affair” started. When I was 17 I was my own worst nightmare. I didn’t eat anything that looked peculiar, was made by a complete stranger or was unheard of. Then I arrived in Mexico and stayed with my grandmothers’ friends. They received us like royalties. So I couldn’t get it over my heart to be picky. I swallowed my “food-fear” and ate what was given to me. And guess what; I actually discovered that food is nice. I remember two things I particularly found mind-blowing: “chicarron” and “mole”. They were so different and new. It was extremely tasty. And so today I whip out mole. Let me warn you here and now, it’s a lot of work! The Mexicans actually declared me crazy when I told them I wanted to make it from scratch. 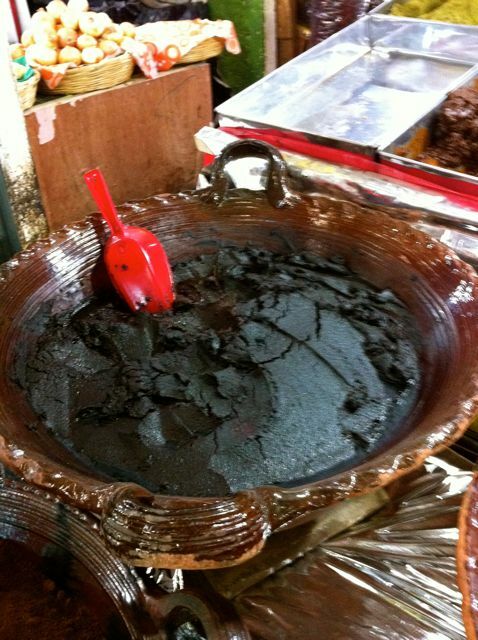 They buy the ready-made paste at the market. Only Mexican grandmothers know the secrets of mole. It’s such a complex and mysterious dish. But it’s absolutely delicious. Mole actually stands for sauce. And basically it could be anything. But the mole I’m talking about is a dark almost black chili-chocolate sauce served with broiled chicken. People think it’s black because of the chocolate. But that’s not true. It’s black because of the dried smoked chilies. As secret as it is, as many variations there are in this recipe. 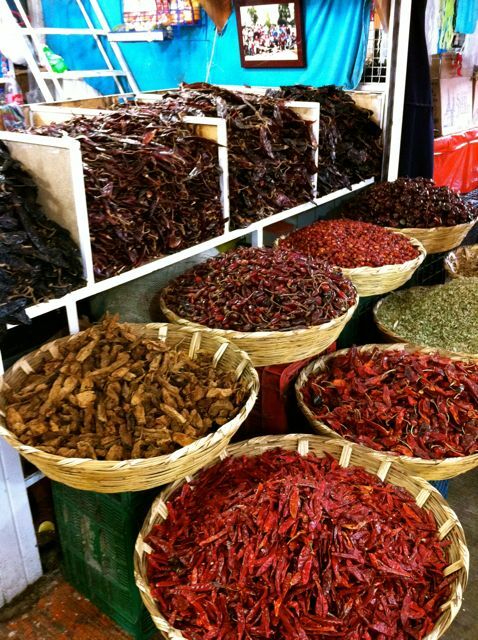 The different regions in Mexico use different layers of flavours. Plus every family has their own secret composition. So you’ll never eat the same mole twice. Supposedly the best one is from Oaxaca. 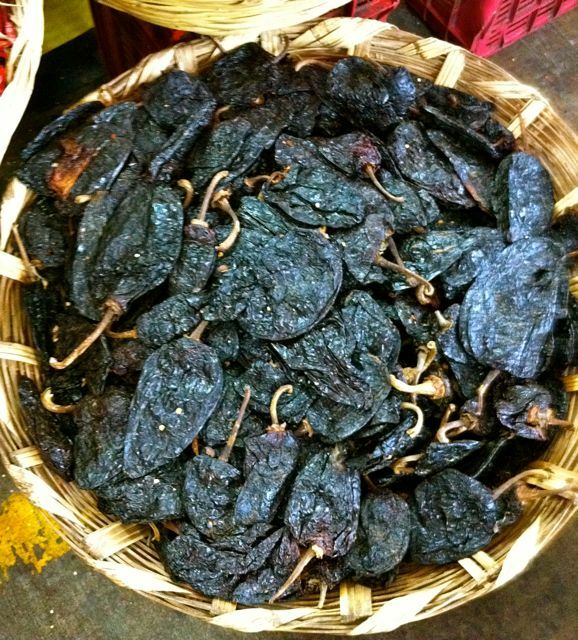 But I also love the mole from Puebla, it’s a little sweeter and stickier! Last time when I was in Mexico I had a mission. I wanted a real cooking challenge. I wanted to learn how to make mole from scratch. A very nice lady from Puebla guided me through it, step by step, at my friends’ place. The house smelt delicious. It wasn’t easy as my Spanish was very rusty. But that’s the great thing in cooking, words and gestures can get you a long way. The best thing was when she went to get everybody in the house to come stir in the pot. Tradition says for good fortune every member of the family has to stir! Yeah, I like some mystical magic! Note: The different chilies are all dark very matured types that are hard to find in Europe but the US might be a little better. In Brussels try your luck in the Matonge neighborhood. Otherwise just ask me and I’ll take an extra suitcase next time I go to Mexico! Makes enough for 30 persons! But the idea is to store it in your freezer in fist size quantities for up to 1 year. So you’ll have to go through this hassle only once a year! Deseed the dry chilies. Roast them on the grill until they start smoking. Rinse them well so the excruciating spiciness is rinsed off. Then put them in a large pot and cook them during 15 minutes in a little water. Once they are softened drain them and keep aside. Next fry all the nuts and spices separately in a large frying pan with some oil. Now put the chilies in a blender and mix to a very fine purée. In a coffee grinder or good blender mix all the ingredients you fried to a smooth paste. Take a large pot and melt the 250g of lard in it until its hot. Then add your chili purée. Fry for 30 minutes. Then add the nuts and spice paste. Fry for another hour on a medium high heat while constantly stirring. (This is where everybody should come and take their turn for magic purposes) Add the chocolate, clove and cinnamon powder halfway. The aromas will come out. All the water should be evaporated at the end and you should have a firm consistent paste. Divide in serving portions and store. A fist size portion of the paste should be enough for 6 persons. Put a large pot on the stove to make your stock: water, vegetables and seasoning on high heat. Bring to a boil for fifteen minutes. Then add your chicken and turn down the heat. Let it broil gently for an hour until the chicken is soft and starts to fall apart. Keep warm. Now put the paste in a large pot and add 4 cups of the chickenstock. The paste will melt into a delicious sauce. Depending on how thick you want your sauce let it reduce or add more chickenstock. Cook the jasmine rice in a steamer or according to packet instructions. When ready, add the chicken pieces to the mole sauce too and give it one last stir. Now dress your plates with some rice and the mole on top. Finish off with some cottage cheese, fresh onions and cilantro. Have some tortilla’s on the side. Jouw wereldkeuken doet ons ook al watertanden!!!! Volgen elkaar op. Reken ons maar reeds als trouwe bezoeker,…. Dankje voor jullie warme woorden in de koude tijden! Jullie zijn de belangrijkste bron voor al het heerlijke dat ik kan produceren. I count myself extremely lucky!! Thank You! Hey, I was there, with you, in the snow – but there was no mention of a mole ! And a mole, in English, is quite a different animal, anyway ! Hi, to Claudine and Mark, also – and thank you both for all that WONDERFUL animal (other than mole) meat you produce with such care and generosity. Previous story Looking for a last minute christmas gift? The book is here!